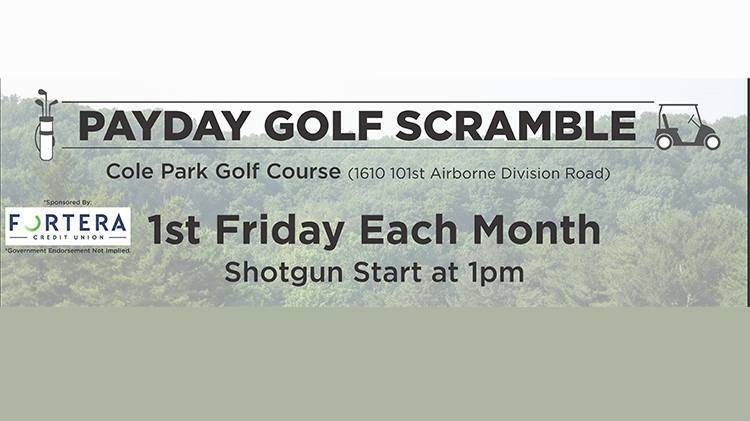 Date: Mar 1 2019, 12 p.m.
Join us at Cole Park Golf Course for a Payday Scramble. Teams are made up of 4 people. (any mix of players). If you don't have a team, the staff at Cole Park Golf Course will be happy to assist with placing you on a team. Cole Park Golf Course is open to the public and anyone can play in the Payday Scrambles. Flights will be broken and winners announced immediately following the conclusion of play. You do not have to be present to win.